There are a lot of misconceptions surrounding refurbished products. We’d like to help set them straight with the facts. These products happen to be our specialty. Often the word 'refurbished' is interpreted as a product which was used, damaged and, at one time, may not be in working order. This caused consumers to sometimes avoid these products. However, a lot of items fall under the term refurbished. For example, a customer can return a product for a refund without even taking the product out of its box. While there is nothing wrong with the product, it can no longer be sold as new. Instead it must be relabeled as a refurbished product. Discounts vary, but on average a refurbished product could result in saving of 15-30%! Minor scratches or dents during shipment, which was returned by the store to the manufacturer. Used at trade shows, stores or by reviewers can be repackaged and sold. Technically there should be no issues and the item is 'like new', but the box was simply opened. Can be found by the manufacturer and will be repaired in order to be sold – as a refurbished item. In most cases, you aren't informed why a product has been labeled as refurbished; a customer simply changed their mind and returned it and you get a new item for less – sweet! Navigating the world of refurbished products is easy if you know what you're looking for. Since Secondipity specializes in this area, allow us to show you how to get the deal of a lifetime. Get the best price for your product, you also get the best product for your needs. If for some reason you’re not completely in love with the product, you have 30 days to return. Using the product’s model number, research how much the product would cost. If the difference is only a few dollars, the refurbished product isn’t really a bargain. Refurbished items are often physically indistinguishable from new items. Used product may vary in cosmetic condition and or may not include the accessories needed to enjoy the item fully. Know the product’s warranty before you buy! An included warranty is a sign that the manufacturer stands behind the product. Keep in mind, some products don’t include a warranty, rather you have you pay for it separately. The length of the return policy varies by seller. 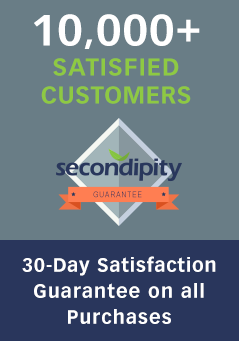 With Secondipity, we guarantee your satisfaction on every product so take 30 days to thoroughly test your purchase. Refurbished products sold on Secondipity may not come packaged by the manufacturer, however, they always work just as well. And you’re not buying the product for the packaging anyway – you want what's INSIDE the box.